There are certain families that I habitually fail to encounter when opportunities arise. I’ve had pretty lousy luck when it comes pittas and broadbills, and I also am really bad when it comes to the various night birds such as owls, nightjars and related species. It isn’t that I never see them, just that I often miss them. 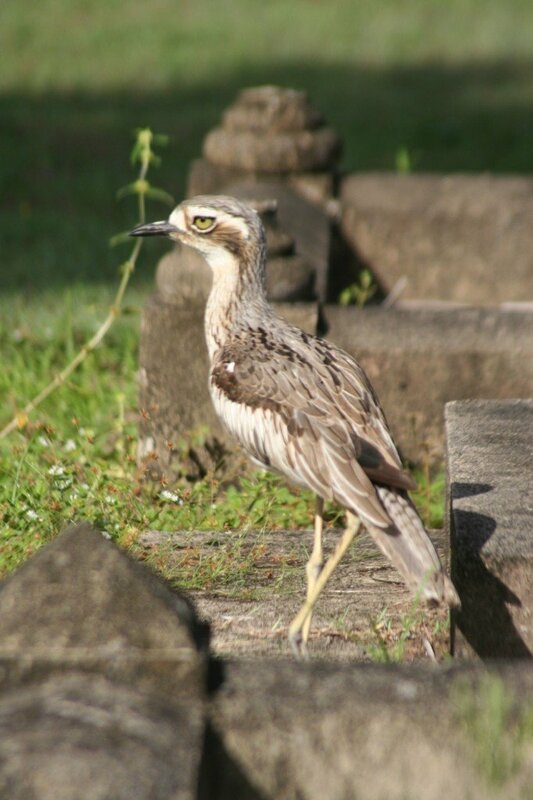 One family I have consistently dipped on are the Burhinidae, known variously as dikkops, thick-knees or stone-curlews. This is a rather odd family of ground living birds that have gone the night bird route of living, a style of life betrayed by their massive eyes. They have a discontinuous distribution but are found on every continent except Antarctica, yet until this year I had only ever seen them in one place, Lake Mburu in Uganda. 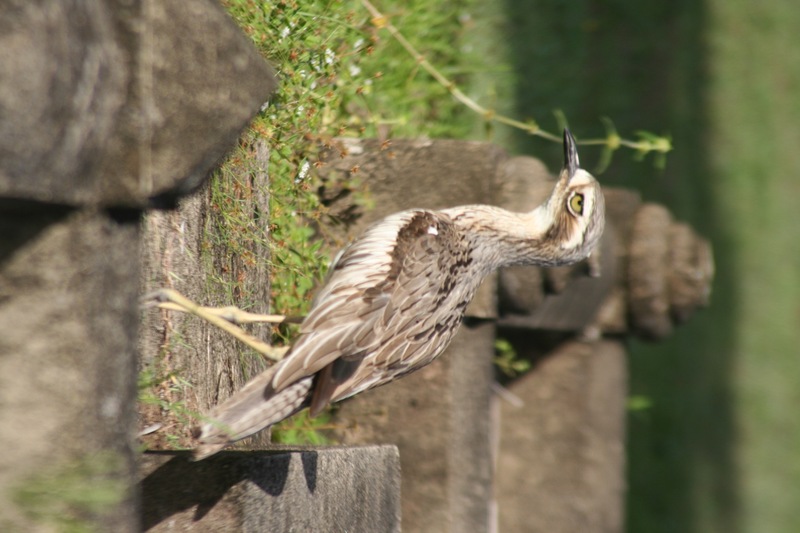 So I was quite excited to visit Cairns Cemetery, which according to most accounts was possibly the place to see one of Australia’s two species. 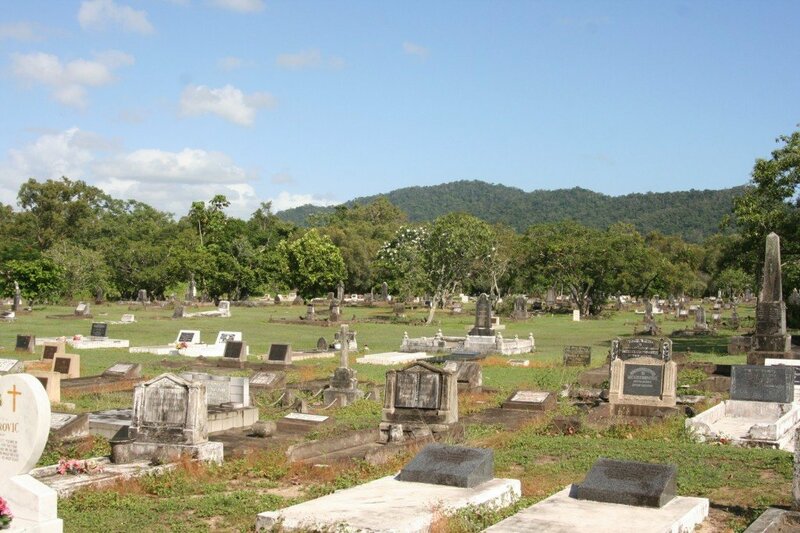 The cemetery was close to the hostel I was staying at, so after my first dawn foray to Cairns Esplanade I bolted down some breakfast and headed over to the cemetery before the day became too hot. I also wasn’t sure how easy it would be to find them and wanted to maximise my chances. As soon as I entered it was clear the place was great for birds, as I soon found a Spangled Drongo, but the first ground birds I saw turned out to be Wattled Plovers. 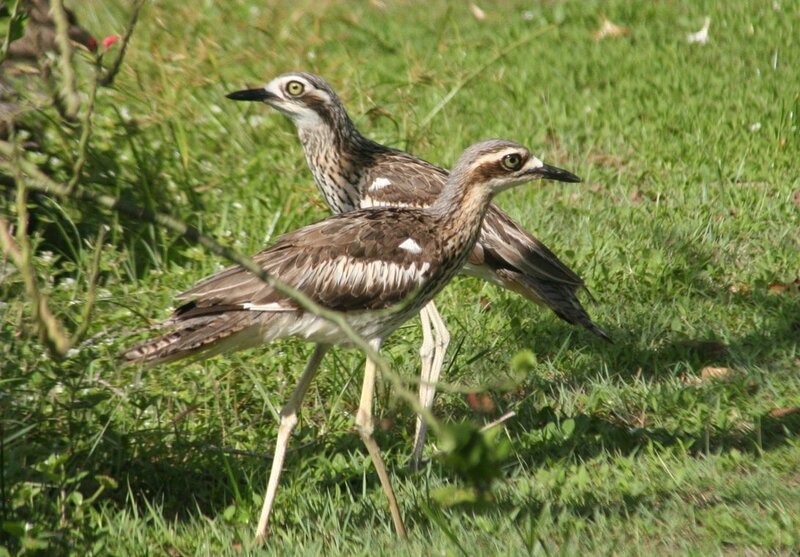 But less than a minute into the park I spied my first Bush Thick-knee. It was under a bush, and I circled the bush trying to get a good angle for a photograph. But as I did so what I had taken to be a stump moved, and then that stump turned out to be another one. And then there was another one. Crossing a path into an older section of the cemetery with larger stone graves there were more and more of them. After years and years of not seeing any I was surrounded by them. 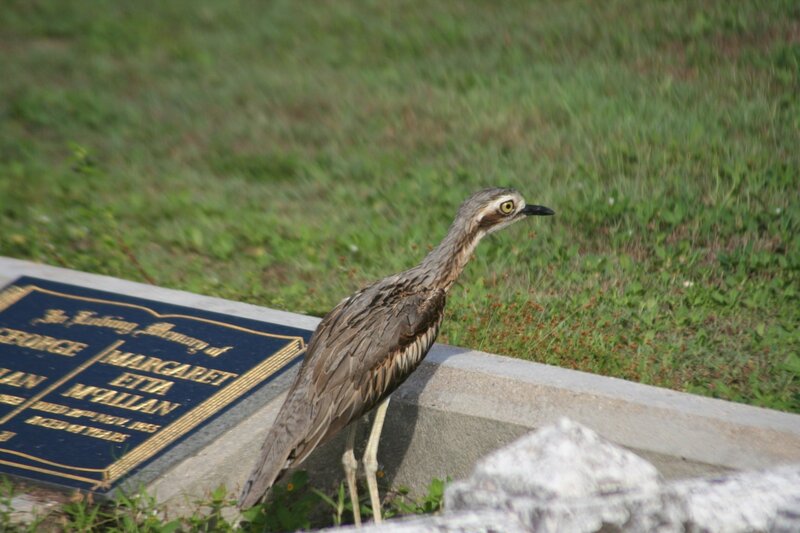 One Bush Thick-knee, ah ah ah! Two Bush Thick-knees, ah ah ah! Three Bush Thick-knees, ah ah ah! Nine Bush Thick-knees, ah ah okay I’ll stop. There were lots of them. I didn’t count them, but there were at least thirty of them that I saw. Thick-knees tend to be social, particularly in the non-breeding season, and this was one of their loafing areas. 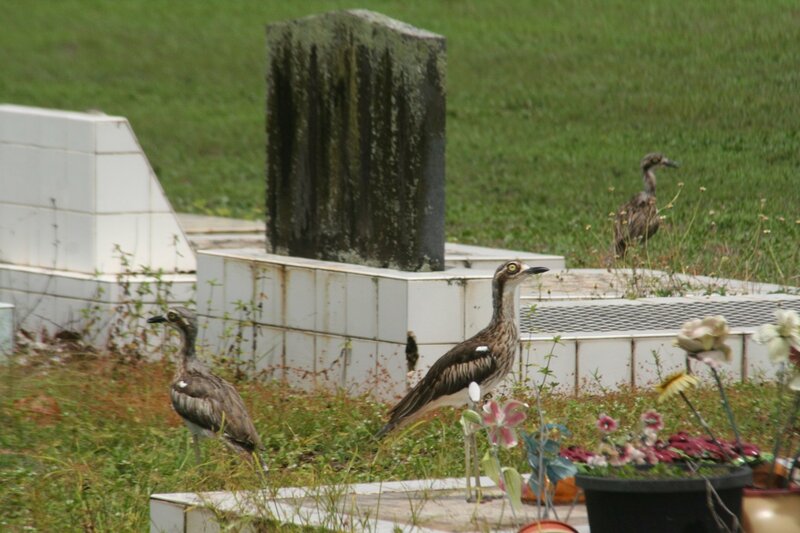 According to a birder I met the Bush Thick-knees that roost in Cairns Cemetery feed on the grass of Cairns Airport at night (causing problems as any bird in an airport can), and a commenter on last week’s post implied they also go to the Esplanade at night. When you die, thick-knees will just walk all over your grave like it’s nothing but a rock to them. So if you are in Cairns and have only twenty minutes to kill make your way to the cemetery for the easiest tick you’ll ever get with this family! 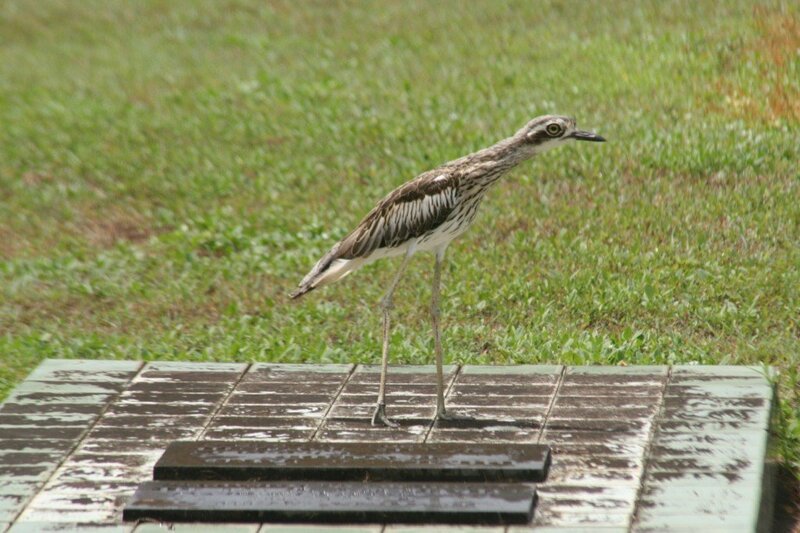 There’s a chance of the beach thick-knee on the Esplanade at Cairns too. For folk further south, Magnetic Island and Anderson Park in Townsville are good spots too. This cemetery is certainly high on the list of “1000 places to see when you die”! Amazing post, I’ve never seen anything like it. 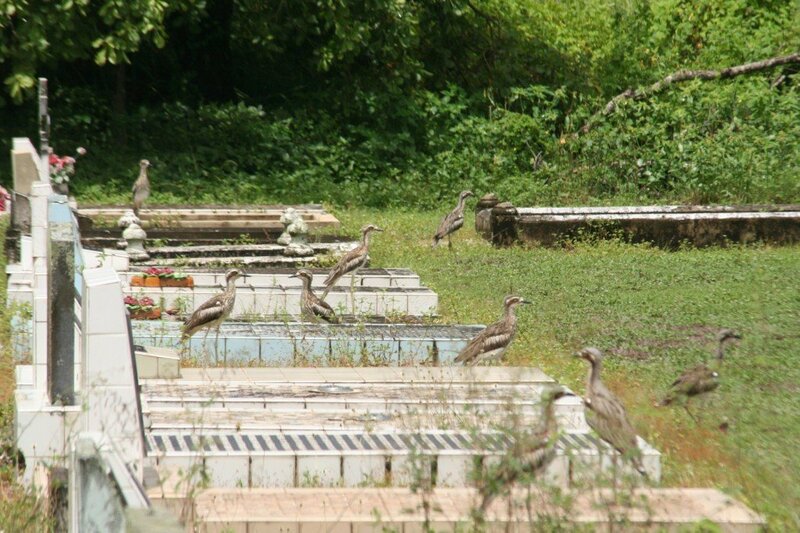 Granted, cemeteries are often good birding spots, but this is in an entirely different dimension! Tai – yes, there were Rainbow Bee-eaters too. Other things as well, I’ll cover them in a later post. Snail – yeah, there are a couple of good spots for Beach Thick-knees around Cairns, but I didn’t see one. Jochen – it certainly was surprising. They used to be very vocal in Darwin around Lee Point caravan park at night and would keep everyone awake! Your post reminds me of a similar experience I had at the Fort Rosecrans National Cemetery, located in San Diego County, California, where dozens of Western Kingbird were perched like sentinels on the gravestones.